This week we are looking at an Italian indigenous variety from Sicily – Corinto Nero. The grape originally hails from Greece, either from the city of Corinth or Naxos. 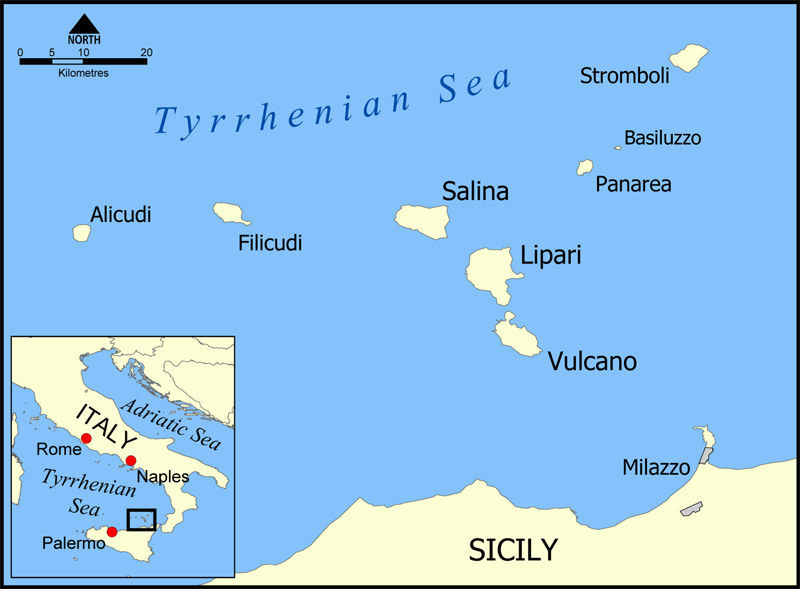 It was brought to the Aeolian Islands off the coast of Sicily sometime in the Sixth Century. Nino Caravaglio started making the wine after a visit to Lipari.I have not had the pleasure of trying it yet but look forward to doing so. It is described as being spicy with red plum notes on the nose and palate. There is also a Corinto Bianco and a Corinto Rosa but they are less frequently planted. Corinto Nero also grows in the Emilia-Romagna region where it is called Tarmarina. Corinto Nero is a hardy variety that was never effected by phylloxera. It grows well in sandy soils and has been able to withstand strong winds that blow in the Aeolian Islands. I experienced those winds first hand on an amazing sailing trip through the islands some years ago. We got caught in a huge storm with 50 knot winds but luckily I had a talented skipper and we were all fine. Some 100 boats were destroyed on Panarea in that storm. No laughing matter. Apart from the one eventful evening, it was one of the most glorious weeks of my life in Italy – no small feat. From Salina, a gorgeous island where il Postino was filmed with wonderful granita alle mandorle Da Alfredo to the lava explosions that continually roll down the side of the mountain in Stromboli known as la Sciara, to the thermal waters of Vulcano, to the caperi and dateri from Alicudi and Filicudi, to Panarea, an incredibly romantic island with no cars and few lights as you wandered around at night, the islands were all just marvelous. Corinto Nero is also grown by the Azienda Agricola di Paola Lantieri on Lipari. For those who can read it, this interview is very interesting about how she decided to start producing wine from her small plot on Lipari thanks to her love of the islands. I can see how so many people go on vacation to these islands and fall in love with them. I know I did and I can’t wait to go back, maybe one day for the Salina Doc Festival, a film festival centered around young directors run by Artistic Director Giovanna Taviani. While there I would love to visit the Capofaro resort of noted Sicilian producer, Tasca d’Almerita.